You can upgrade to bigger packages (up to 100 PBN links) by choosing one of the gig extras. Yes, all our PBN sites are indexed on Google. 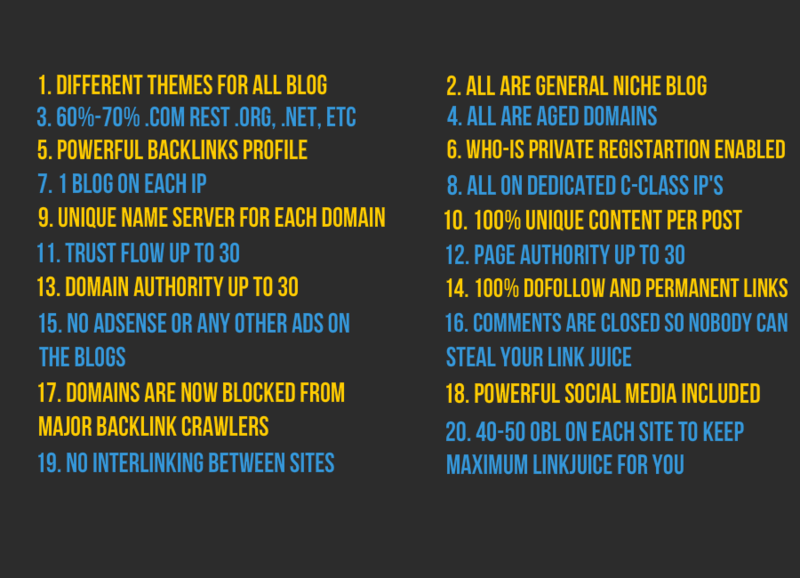 How many URLs and keywords are allowed ? Your post will remain on the site's homepage for about 5 to 7 Days and then will roll off to inner page PERMANENTLY. We use high quality readable niche related 500+ words manually spun contents for each post. Yes, we will provide a complete and detailed excel report of live links. How long to process the order? Minimum of 5-10 days drip feed is mandatory. Permanent 5 PBN Links - DA 20+ and TF 20+ is ranked 5 out of 5. Based on 234 user reviews.